**As of November, 2017 Kauai Tree House has a new dining room table, Master bedroom set, livingroom sectional and newly painted rooms. This 3 bedroom home is fully furnished including linens, games, videos and music, with I-pod friendly stereo system. Riverfront property allows privacy and you can float down stream to a private beach setting. Our location is in the middle of one of the finest examples of old Hawaii left today. Each bedroom has a king size bed, quality mattress and new sheets and pillows. Nice bedroom furniture and fans in all rooms, including the main lanai, which is screened-in. Master bedroom is very attractive and has a new flat screened TV. The house sits up high overlooking the clear water stream and hosts ducks, fish and many other endangered species in a pristine setting. As a guest at Kauai Tree House & RE/MAX Kauai, you'll have access to Kauai's Premier Concierge Service at (855) 665-2824 or visit http://kauaiva.com/index.html we will help you build your perfect vacation. Overall, we were quite satisfied. Happy with Remax and the rental process. Location was good for us. We wanted some privacy. If a guest wants attractions, restaurants and stores within walking distance, this would not be the place for them. But for our family, it was great. The only complaint is that there were cobwebs in the corners both floor and ceiling which bothered my clean freak wife. Other than that, it was clean and well maintained. There were neighborhood dogs barking all night long, but it was cool enough at night so we closed the windows and then it didn't bother us. Great place to rest and relax. Home was great for family & friends. 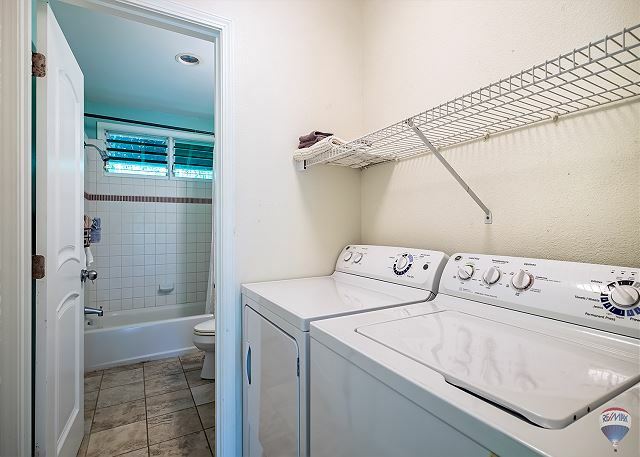 Niklas E from Santa Barbara, CA does not recommend this vacation rental. Katrina D from Hillsboro, OR does not recommend this vacation rental. We forgot that this property doesn't have AC. It was a little hot because of that but it also meant open windows. There were screens but still lots of bugs. The home was very clean, nice linens, well stocked kitchen. We thought the house was in Hanalei Bay since the map on the homeaway page reflects that. The house is infact 3 miles outside of Hanalei Bay so a car is essential. The house itself is nice and comfortable. It comfortably sleeps 6 people and is in good condition. Overall, good experience but would stay in Hanalei Bay next time. We loved our time at the Tree House. It was a bit difficult to find the first time at night but it is the last driveway on the left after Sushi Girl and before the double bridges. My husband and I rented the house for a week to have a family vacation with our sons and daughter-in-law. It was spacious and well appointed for cooking and relaxing. It is close to the mountains, beaches, Hanalei and surfing. We had everything we needed for our vacation right there. It is by a small river so along with the roosters there are also the sounds of the bullfrogs at night. For us, the sounds of nature replaced the sounds of the city - NY- where we are from. Great time. We would do it again. We loved staying at the Kauai tree house. The kids loved searching for geckos and sometimes we didn't have to search far. A few showed up inside, but that's the beauty of such a tropical location. We loved the view of the trees and being so close to the beach. The toads in the river were a bit louder than we liked at night but closing the windows was enough to solve the problem. Light sleepers may want to bring along earplugs. The house was a little hard to find. The driveway entrance is hidden right before heading over the double bridges. We passed it the first time and almost missed it the second time. I was a little disappointed in the kitchen. There weren't any spices available which makes cooking a bit harder. We didn't want to buy a lot of things that we would have to throw away so ended up with some bland dinners. If you're planning to cook a lot like we did it would be helpful to bring along some small spice jars. The house is really close to some great beaches. We found one spot that we could walk to but chose to drive to the ones a bit further up the road. Walking along the main road and across the bridges was a little too sketchy for us. We all loved the house and really enjoyed our stay. We would absolutely choose the tree house again for our next visit. We all really enjoyed our stay and would absolutely stay at this house again. We stayed in the treehouse for 9 nights with our family of 6. It was just as described. Roomy, bright and airy. We loved lying in bed in the mornings listening to the breeze in the banana trees outside our lanai, and hearing the birds and frogs. (And of course, the roosters!) There were barking dogs occasionally, and some neighborhood construction noise from accross the river, so if you are really sensitive to noise, you may want to look elsewhere, but we were not bothered by it. The short walk to the very private beach was worth it! After going to beaches all around the island, it was almost unanimous that that one was our favorite. The kids enjoyed using the boogie boards and inflatable tube to float down the stream to the beach. There were 3 boogie boards, an inflatable tube, and 2 snorkel sets. Also, beach chairs an umbrella, and a cooler. It's a short and beautiful drive to Hanalei, or a very short drive in the other direction to more beaches and the end of the road. The setting is private and so gorgeous. Everything we had hoped for and more! Oh- and by the way, the coffee maker is not broken- just SLOW!! Give it plenty of time, and you'll have a fine cup of coffee! :) or, if you get coffee at the Hanalei Bread Shop, you'll never want to make your own coffee again!! Should never have done it, ha ha! The house was perfect! It had everything we needed and was in a very nice quiet/ private setting yet only 5 min to beach. We really enjoyed floating the creek to the beach! I have absolutely no complaints at all. Overall all of my party enjoyed our stay at the Tree House, being outside of Hanalei but just a short drive away was a big plus for us. The house was very clean, beds were comfortable, kitchen well equipped, and the beach chairs and boogie boards were much appreciated. Cell service is limited here but the wifi at the house was very fast, 30 mbps down. In its secluded location the roosters were actually not heard too often, and others complaining about the dog noise didn't end up being a factor for us - they would bark in the evening when you could tell they got home/were being fed and maybe once more in the night but never for more than a couple minutes, even then they are a decent distance away and not too loud in my opinion. Only qualm with the house was fruit flies getting in due to their ability to get in past the screen mesh, was bothersome one night. Loved the location, loved the house, would stay here again in the future. The house was nice, although we noticed burnt bulbs, non functional smoke detectors, exposed wiring, missing faceplates both inside and outside of house. Overall it was comfortable and it was nice that there are two bathrooms. It was close to some beaches and a few shops, Sushi Girl was great! It was nice to be "away" from the busier part of the island, and the property has beautiful plants everywhere. There are chickens and roosters all over the island so we were woken up very early every morning by the roosters. If you are a light sleeper, you will struggle but it might be like that all over the island for all we know! There were also several occasions where neighboring dogs barked continuously for extended periods of time. The couple that slept in the master bedroom could hear cars crossing over the nearby bridge throughout the night. We love this house and hope to stay again. It's proximity to Sushi Girl was an added plus. The house was Wonderful. Our whole family enjoyed the space relaxing,cooking,and playing games. We all agree it was the Best so far. Wish I was still there. Only downside was a couple of nights of loud barking dogs . The Kauai Tree House was a great place to stay in Kauai. This is also the best location in Kauai as you are close to Hanalei and some of the best beaches on the island. We would definitely stay here again! We thoroughly enjoyed our visit to this rental home. The property was clean and well stocked with everything needed to live day to day. We really had no interaction with the property manager except when we arrived a little before check in and needed help to access the home. The property is very private and lush with tropical foliage. All week we couldn't believe how lucky we were to be able to call this lovely home ours for a week. Thank you to the property managers for providing us such a fantastic place to call home! Fantastic time in Kauai. Always the absolute best island. Tree house next to the river. More remote than anticipated, heavy rains flooded the highway and the parking area, but not a problem. Propane was empty so no BBQ. Could have used more kitchen utensils and cook ware, but we made due. Great place. Would definitely visit again. This home in the trees is ideal for people looking to escape the resort areas and to experience the ambiance of a natural location. There are many beautiful beaches a short drive away. Our vacation here was a peaceful get away that we thoroughly enjoyed. The Kauai Tree House was just how it was described and perfect for our holiday! Would request to have beach chairs and other beach toys available as there were none. There was an occasional barking from the dogs nearby but tolerable. I would also request that the "activity" book be updated and made easier to read. Although the concierge service provided through the property manager was great and we used them to book a few services. Also, suggest that you don't arrive after dark on your first visit as it is difficult to find - although that is part of it's charm. All together it was a fantastic location!! We recently spent 3 weeks in this beautiful home nestled alongside the river and a very short walk to the beach. We loved being so close to Hanalei, our favorite place in Hawaii, as well as being in nature. For those that love to be away from the tourist traps, this place is perfect. Had fun floating down the river to the beach, listening to the birds singing day and night, and enjoying the immaculate property. The property was very clean and well-maintained. We were celebrating a 60th and 65th birthday with friends and family who came and went during our 3 week stay. They all loved it as well. The drawbacks were 1) the bugs and mosquitoes (you will need to drench yourself in bug spray); 2) the pack of barking dogs who gave us a daily concert between 6 to 9 PM every night for three weeks; 3) the sensation of being in an earthquake whenever anyone walks across the floor (the house is high above the ground on stilts and shakes quite a bit, but you do get used to it after a few days). REMAX in Princeton was very slow to respond to requests (freezer wasn't working, no smoke detectors which are needed as there is only one exit from the house), but they did eventually respond after a week and a half. The house was large enough for 7 of us, with plenty of space for all. Your cell phones will not work here, except for texting, but wifi was consistent. We switched to the web based Viber and were able to make calls to folks back home. Overall, it was a terrific place to stay, but a little too many drawbacks for us to book it again--especially the swarms of mosquitoes and bugs. We have stayed in may house rental on Oahu & Kauai and this one is on our top 3! The stream almost beneath was was amazing to listen to along with the various birds etc. The home is very well kept and quite spacious. The enclosed lanai was a favorite for our family as well as all of the personal lanai's for each bedroom. The one thing that we noticed that other people didn't like were the barking dogs at night, we understood that they are hunting dogs and it wasn't all night or if it was raining. We would go back! We visited the Kauai Tree House and stayed 5 days as we were attending a wedding in Hanalei. The location of the tree house doesn't show up properly on Google or Apple Maps, which is a bit of a problem and led us to thinking that we were less than a mile from our friends, when in reality, we were about 4 miles away. However, it wasn't too bad from this perspective. The house does not have A/C, so in order to keep it cool, windows and fans must be ran at all times. We also had a couple of issues with dogs barking incessantly at night and bugs (lots of mosquitoes and other bugs in the house). Overall though I think we were pretty satisfied with the house as it was well kept, had 3 full bedrooms and 2 full bathrooms, and was fairly close to where we wanted to be. We loved the tree house! The house is beautiful, great location, spacious, very clean. We loved kayaking down the river to the ocean (but don't try this after a heavy rain!) We would definitely come here again, it was paradise. The Tree House offers a lot of privacy in a very comfortable home. The bull frogs in the river/creek provided a pleasing sound. The house was spotless when we arrived and well equipped. One loss of wifi was quickly resolved. It was easy to find good eating places in Hanalei for lunch and dinner. The Limahuli Garden and Preserve was a nice place to visit. Verizon cell phones couldn't get a signal in the house, but when on vacation, who cares? Pleasant memories and the screened in linai was great place to sip a glass of wine, or read a book. We really enjoyed the house, we loved the screened lanai and the mattresses were super comfy! However we surely had a great stay! We arrived very late in 2 cars. It was a little hard to find as the description mentioned bridges and there were many before the house but they weren't the right ones. One driver made a few wrong turns. We did Ok getting in using the lock box. Very clean and well maintained, decor was easy on the eyes. Size: Adequate for 6 (3 couples), and for the 7th person, staying out on the screened porch, was adequate as well, but not if they are light sleepers, or got cold easily. Luckily my son did fine out there. There were very few bugs! 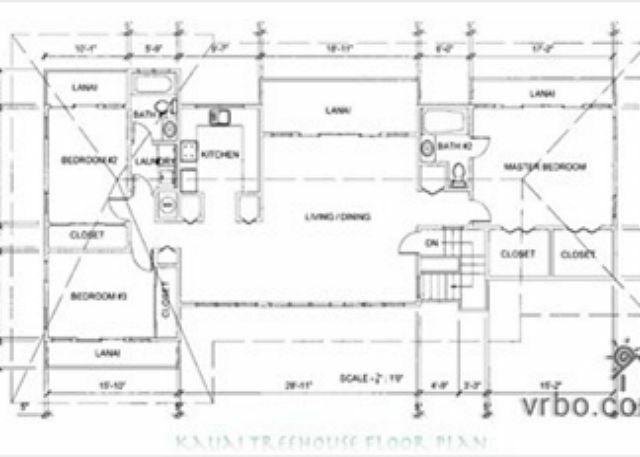 Very clean, kitchen roomy and could work in it with 3 or more people at times! We took a few handy knives which came in useful but there plenty there. The barking dogs were a bit troublesome, mostly in the late nite, and early hours at times. however, it was cold at nite when we were there, and we had the windows closed, so the noise didn't really disturb us. It was great to come back to after an active day to relax. The fridge was a good size. The beds were good, with very nice linens. The layout meant one couple had the master bedroom with ensuite, and 5 people mainly used the other bathroom which wasn't too bad, but had to coordinate at times. We had one flooding warning but were confident the house would have stayed dry. We had a problem with one toilet and Remax sent a person to fix it very quickly, which was great! As it was December, we were lucky to get the number of sunny days we did get, and did get into the water several times on calmer days. Overall, for a group of 7 looking for self catering vacation, it was a great choice! We loved this home! The fans provide excellent circulation, and the outdoor noises are amazing (though starting early). Spacious home in the heart of the lush and beautiful north, close to Tunnels and other excellent beaches. Even driving through this area was fun! Large soft beds, nice open living area with huge couch and attached porch. The kitchen gear could use an upgrade, like sharper knives. Very clean, and the closet has games, snorkel gear, toys, books, and a ton of videos. Cool little artist coop gallery right near the house. We drove down the road next to the Hanalei National Wildlife Refuge with great views and cool birds. Snorkeling, surfing, sand castles and hiking -- a wonderful time! Thank you for sharing this memorable home! Spacious residence is a little far from everything. Bill P from Vancouver, BC does not recommend this vacation rental. Overall, our group of four adults was comfortable in the spacious house: The layout is very functional; beds are cozy; there is plenty of storage; the newer appliances, including washer and dryer function well; the kitchen was probably well equipped so time ago, it is now missing some essential tools such as a cheese grater, sharp knives, vegetable peeler, good corkscrew and can opener that works; beach chairs and coolers are great, all three boogie boards are broken; the Wi-Fi is reliable, but generally the electrical system is haunted with several lights that did not work even after replacing the light bulbs. Make sure you arrive in daylight or else you may never be able to open the lock box, and be very careful on the steps. The landscaping is overgrown, dead palm frowns litter the access road and the property, and the area under the house is where junk is piled up. Secondly, insects are really annoying, almost as much as the ever crowing roosters, the drumming noise and the barking of at least a dozen dogs from the adjacent property, which we understand are beyond the owner’s control. We ended up using the screen enclosed balcony the most. Home was nicely furnished and well equipped. Walking distance to a small shop and "view" of an inaccessible beach. River behind house was pretty but not one we would swim in... Beds were very comfy. Location was good for North Shore, but expect a fair amount of driving to shops, beaches and restaurants. It was not a problem for us. Fantastic home in a perfect location. This house was awesome. Everyone in our party was extremely impressed with it. The screened in lanai was especially popular. a guest from Santa Monica, CA does not recommend this vacation rental. The treehouse was amazing!!! Loved the decor....very "beachy". When we arrived, the home was very clean and had everything you could want...and more. Beach chairs, movies, games....etc. Tons of towels, bedding...well stocked kitchen. The washer and dryer was so handy. Our favorite spot was the screened porch over the stream with daybed and table/chairs....we spent most of our time there relaxing and eating all our meals. There are ceiling fans in every room and ALL the beds are sooooo comfortable. Location was great, close drive to the little town of Hanalei and down the road was a fabulous restaurant, Mediterranean Gourmet, where they host a Luau on tuesday evenings, a must do! One thing I have to point out....since the house is on stilts, whenever a car drives over the bridge just outside the home (which happens often), the house sways a bit...like a teeny husband actually got a little "off balance" and had some vertigo.....but everything else is a huge plus and would highly recommend the treehouse. No bugs inside...only tiny little geckos (so cute), a few big spider webs outside...but hey, your are in the tropics, it's their home! Beautiful landscape and stream just outside that leads to the ocean... you could kayak to the beach, but it's not walkable. Nothing is walkable from the house....have to drive...but close to all the sights on the north shore. Can't wait to return!!!! We loved everything about the treehouse except the location. Quite a drive into Hanalei and even though there was a great beach just a little ways down the road, I wasn't comfortable having my children walk on such a busy road. Our two week stay on the north shore Kauai was truly an adventure in paradise. The tree house was clean and very well equiped. The beds are new and very comfortable. The cool wind in the banana trees, the birds, the frogs, the sound of the river, and the even chickens all added up to a great jungle experience. It was too quiet when I got home and I couldn't sleep right. The lanai was everyone's favorite place to lounge, read, and hang out. The house offered good privacy and everything we needed, even a friendly geko in the bathroom who ate the rare mosquito. When the toaster broke, Remax had another one on the porch the next day. The tree house was close to excellent beaches and good snorkeling. The farmers market in Hanalei was a blast. Thank you for an excellent vacation. Note: I cleaned out the vacuum cleaner and the brush but it still does not have much suction - does not pick up sand too well. I think it needs a new impeller. The carpets may suffer a little from lack of a good vacuum cleaner. We stayed at the Treehouse for our Honeymoon and it was absolutely amazing. The picture don't do justice to how beautiful and unique it is. We tend to like "off the beaten path" types of adventure and this fit perfectly. 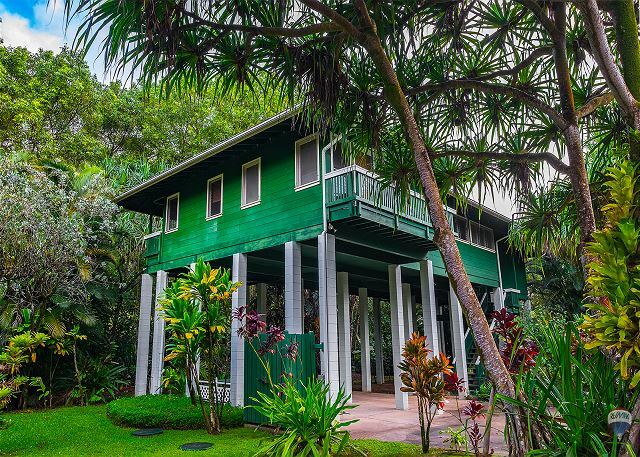 It is beautifully decorated, nestled in the canopy and near lovely Wainiha Beach. Hanalei is about 10 minutes down the road which is a lovely surf town. We can't wait to go back! Hoping to make the tree house an annual trip! My wife and I are in love with Kauai and truly love the north shore. With all of it's amazing views and beaches. And not to mention our favorite town on the island Hanalei. There's great hiking and great people in this is a fabulous place to stay. The house is in great condition and very clean. It's also close to everything that is North Shore. We had total of four and our party and the house could have slept 6 comfortably. Will be back soon keep a light on for us until then. We loved the Hanalei area and can't wait to return. The Kauai Tree House is an exceptional experience. Our family really enjoyed the openness of the house, the wonderful tropical breezes, and the sounds of the birds, the rain, the frogs, etc. The dogs in the kennel - across the river from the house - bark at different times and that can be annoying when you're trying to sleep, but we acclimated to them quickly and hardly noticed them by the time we left. The kitchen is well-stocked, expect that there was no coffee pot. For a group of caffiene fiends, that was a problem. The house is extremely well-located, with easy access to all of the wonderful beaches and hikes in the Hanalei area. We had a wonderful time here and look forward to returning. Please buy a coffee pot by then! Nice, roomy place for family of 6. Very useful kitchen. Good location for traveling to different places in Hanalei. Not good if you want to play in the yard or ride your bike on the roads. Mosquitos problematic. The river looks so inviting but you can't swim in it. Ke'e Beach, snorkeling, hiking, shopping are great in Hanalei. My friends and I stayed here for a girls week in Kauai and it was perfect! The house is located close to Hanalei, the Na Pali coast, and beautiful beaches. It is located on a private drive and was very relaxing. You are truly up in the trees which keeps it cool and allows for lots of great noises! On the ground, the roosters crow all day and dogs bark at night. We didn't mind these noises but they many not be for all. The house itself is very comfortable and provided a great home base. The kitchen had everything we needed (blender, coffee grinder and maker, pans, etc). All the beds were comfortable and the house was very clean when we arrived. There were a lot of bugs and a few geckos but again, this is part of vacationing in Hawaii. I cannot wait to visit the Treehouse and North Shore again! What a fantastic experience we had staying at the treehouse. It was exactly as described and we found it to be a lovely home in which we will return to. Just loved the sounds of the birds and frogs, felt like we were in the middle of the jungle but the location was totally convenient. Thank you for providing the backdrop for such a memorable vacation! This was my second visit to Kauai and this location was nicely different from my past Princeville experience. On the north shore beyond Hanalei, it was wonderful to be in a lush garden setting on the garden isle and up in the air in a house on stilts. It was a very handy location for visiting the north shore beaches stretching from Hanalei to the Ha'ena State Park. You do have to get used to the crowing of the wild Kauai chickens that roam everywhere. The roosters were particularly noisy all through the night of the full moon, and became a bit quieter as the moon waned, saving their cacophony for actual sunrise. The unit did not have A/C, but being there in late January to early February, the days were pleasantly warm and nights cool enough for good sleeping. Escaping the cold midwest, I thought the weather was ideal. There was only one drawback I would feel remiss in not mentioning for anyone very sensitive to noise. Someone in the little valley and on the other side of the stream had a group of dogs that could sometimes launch into extended barking jags. Overall, however, this was a great place. Great House, may return during the dry months. This was our first trip to Hawaii we can there to get married not only was the island amazing but the tree house was also amazing. It was in a great location to some beautiful beaches. It was nice to come back after some long days and unwind, we felt like we were at home. Would we stay here again most definitely! And we are already talking about when we are going back. It was nice that there was all the little extras at the tree house. Thank you for sharing your home with our family it made our vacation unforgettable. House and setting are a slice of old Hawaii, the kind of atmosphere that most of us expect of the islands, but often miss. The raised home boast a lanai at each of the three bedroos and a screened lanai off the living room that overlooks lush tropical landscaping and a gentle stream. Drive north and in a few miles reach the end the road and a hike into the Napoli coast. Drive south and in another easy drive, provisions, shopping and dining can be found at charming Hanalei. Great beaches are everywhere, and don't overlook the Taco Wagon parked near the Hanalei Pier - the fish tacos are excellent. We really enjoyed our stay at the Kauai Tree House. Tropical Delight - I Felt Like I Was in a Rain Forest! Absolutely LOVED this house - especially waking up to the sounds of birds of all kinds singing and calling! The king size beds were very comfortable and each of the bedrooms had it's own private balcony. We never used the dining table as the screened-in lanai was so pleasant! The grounds were like living in a botanical garden - gorgeous! Definitely got our exercise in with the steep staircase! Boy, a hoist would have been nice for our very heavy luggage. Quite a sight - it took 3 middle aged women to carry up one bag at a time! As far as the 100 yards to the ocean in the ad; hmmm... maybe as the crow flies? Definitely had to drive to the ocean but beautiful beaches were not far away. The road is way to narrow to safely walk on it and very heavily traveled. We had some bugs but we are gecko friendly people and didn't mind that they appeared in the evening to try to take care of the evening buggies. Just recommend keeping all foods in the refrigerator. Too bad there was road construction on both the highway and the road just across the river to the rear of the house. Very loud. At least they did not work on nights or weekends! I would definitely suggest going back to this house again. Eventually the road work will be finished - yeah? We stayed here for 4 days (while we toured the North Shore). The home was absolutely lovely! We had 4 teenagers with us and they thought it was so cool that they did a "Cribs" video. The location is perfect if you want to see the North Shore as it's right in the middle. The home is very roomy and very clean. The grounds are awesome (very tropical) and you can float right to the beach (or walk)! It was a perfect stay! calls from the management but were not at the house at the time. Other than a few existing holes in the walls and the fact that the garbage disposal did not work....the house was perfect!